Hiatus hernia or hiatal hernia is the protrusion (or herniation) of the upper part of the stomach into the thorax through a tear or weakness in the diaphragm. The symptoms include acid reflux, pains, similar to heartburn, in the chest and upper stomach. In most patients, hiatus hernias cause no symptoms. Sometimes patients experience heartburn and regurgitation, when stomach acid refluxes back into the esophagus. The diagnosis of a hiatus hernia is typically made through an upper gastrointestinal barium x-ray or by gastroscopy. The first (95%) is the sliding hiatal hernia, where the gastroesophageal junction moves above the diaphragm together with some of the stomach. The second kind is rolling (or paraesophageal) hiatal hernia, when a part of the stomach herniates through the hiatus beside, and without movement of, the gastroesophageal junction. In most cases, sufferers experience no discomfort and no treatment is required.Symptomatic patients should be told to elevate the head of their beds and avoid lying down directly after meals. If overweight, weight loss is indicated. Medications that lower the LES pressure should be avoided. Antisecretory drugs like proton pump inhibitors and H2-receptor blockers can be used to reduce acid secretion. Endoscopic plication or radiofrequency energy delivery to the LES may be considered. Surgery should be considered if these modalities don’t work. Surgery usually consists of Nissen fundoplication, which usually is successful in eradicating symptoms. Where severe and chronic acid reflux is involved, surgery is sometimes recommended, as chronic reflux can severely injure the esophagus. Persons requiring surgery might experience heartburn or might not perceive any symptoms. A Nissen fundoplication is performed laparoscopically; however, this can have both severe and minor side-effects. Minor side-effects of this procedure include increased production of stomach and intestinal gas, and chronic nausea; major ones include permanent severe discomfort when eating and passing food into the stomach, inability to vomit or belch normally, and limited stomach capacity. Symptoms depend greatly on individual anatomy and surgical technique, but due to the severe degree of potential discomfort in some cases, surgery is only recommended as a last resort if medication therapy is ineffective or impractical. Traditionally, surgery was recommended as a primary solution, but a statistical increase in complications and severe discomfort levels among patients, resulting from the high volume of procedures performed, has led to a radical change of practice and attitiude. Another method for treating this condition is chiropractic care. Chiropractic adjustments at the T5-T6 spinal nerve root levels have been found to help minimize the effects of this pathology. A hiatus hernia per se does not cause any symptoms. The condition promotes reflux of gastric contents (via its direct and indirect actions on the anti-reflux mechanism) and thus is associated with gastro-esophageal reflux disease (GERD). In this way a hiatus hernia is associated with all the potential consequences of GERD- heartburn, esophagitis, Barretts oesophagus and oesophageal cancer. However the risk attributable to the hiatus hernia is difficult to quantify, and at most is low. Besides discomfort from reflux and dysphagia, hiatal hernias can have severe consequences for patients if not treated. While sliding hernias are primarily associated with gastroesophageal acid reflux, rolling hernias can strangulate a portion of the stomach above the diaphragm. This strangulation can result in esophageal or GI tract obstruction and even become ischemic and necrose. Another severe complication, although very rare, is a large herniation that can restrict the inflation of a lung, causing pain, breathing problems. 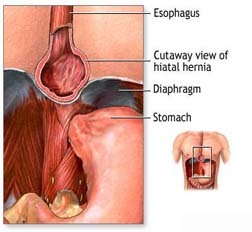 Hiatal hernias affect anywhere from 1 to 20% of the population. Of these, 9% are symptomatic, depending on the competence of the lower esophageal sphincter. 95% of these are “sliding” hiatal hernias, in which the lower esophageal sphincter (LES) protrudes above the diaphragm along with the stomach, and only 5% are the “rolling” type (paraesophageal), in which the LES remains stationary but the stomach protrudes above the diaphragm. People of all ages can get this condition, but it is more common in older people.